Nicholas Bertram (from left), president of Giant Food Stores; event speaker Brooke Belle; Dr. Saba Khan; and Doug Hock, executive vice president and chief operating officer at CHOP, cut the ribbon for CHOP's new Healthy Weight Food Pharmacy, which Khan will direct. 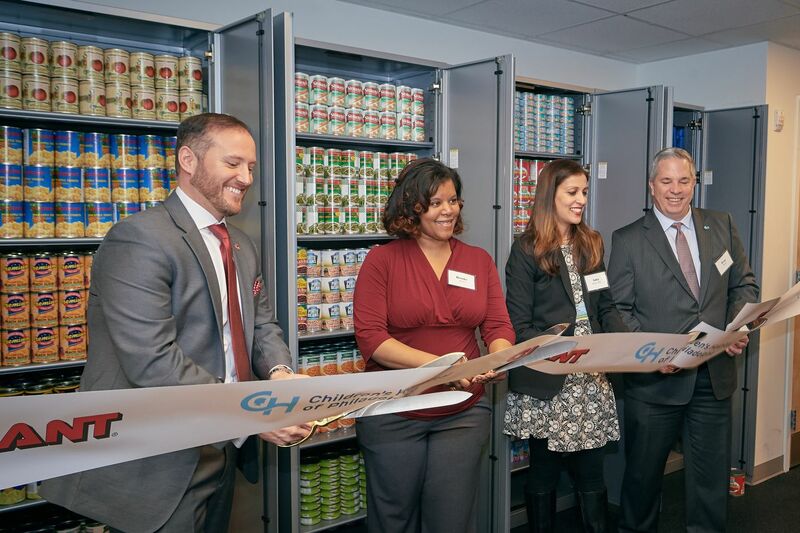 On January 23, Children’s Hospital of Philadelphia held the grand opening of its Healthy Weight Food Pharmacy — one of the first pediatric hospital-based hunger-relief programs of its kind in the country. This in-house fresh food pantry is the result of the collaborative efforts of CHOP, Philabundance, and Giant Food Stores and will be administered through CHOP’s Healthy Weight Program, which is designed to treat and prevent childhood obesity. Saba Khan, M.D., will serve as its director. The Food Pharmacy is built on years of research conducted by Khan and researchers at PolicyLab at CHOP, whose findings include a link between poor health outcomes and food insecurity, particularly in underserved populations. This link is thought to be the result of a lack of access to healthy food and safe places, compared with easy access to food that has little nutritional value. The Food Pharmacy will screen all patients — both new and returning — for food insecurity during each visit to the Healthy Weight Program. We use a two-question survey developed by the Department of Agriculture shown to identify food-insecure families with 97 percent accuracy. Families who don’t know where their next meal is coming from will be given immediate access to healthy food from the pharmacy, along with a referral to a social worker to identify longer-term solutions. We anticipate that 12 percent to 20 percent of the families seen through the Healthy Weight Program will access the Food Pharmacy. Both childhood obesity and hunger are highly complex societal problems. According to the latest Feeding America Map the Meal Gap study, almost 200,000 children are food insecure in the Delaware Valley — 75,000 in Philadelphia alone. The Food Pharmacy’s cutting-edge approach to such immense challenges is only possible through mission-driven partnerships between the corporate and the nonprofit sectors, such as the one between CHOP, Philabundance and Giant. The partnership allows CHOP to tap Philabundance’s expertise as the region’s largest hunger relief organization while relying on Giant’s financial commitment. Giant’s $173,500 grant to CHOP for the Food Pharmacy is not the company’s only contribution to improve childhood health or tackle hunger-related issues in the region. As part of Giant’s 95th anniversary celebration, the company awarded $1 million to Philabundance to support children’s programs, the Philabundance Community Kitchen culinary program for low-income adults, and an endowment that will continue to fund the fight against hunger. Over the course of Giant’s 22-year partnership with CHOP, the company has contributed over $18 million to hospital initiatives, including $5 million toward the construction of CHOP’s state-of-the-art Buerger Center for Advanced Pediatric Care. In addition, Giant’s president, Nicholas Bertram, serves on CHOP’s Corporate Council. The Food Pharmacy is one component of CHOP’s recently launched strategy, “Healthier Together,” which aims to give every child a fair chance at a healthy future. Healthier Together addresses poverty-related issues that have a lasting impact on children in our community, focusing on hunger, asthma, behavioral health concerns, and violence. Four principles guide Healthier Together: to make strategic investments in programs and services that are proven to work, invest in workforce development programs that help parents find jobs, buy local for the initiatives when possible, and seek input from community stakeholders to make sure our work reflects their needs and values. With Healthier Together, we will create value for our community with every dollar we spend. The collaboration between CHOP, Philabundance, and Giant on the Healthy Weight Food Pharmacy represents more than a unique approach to tackling deep-seated problems in our region. The initiative further offers an exceptional model for how socially responsible corporations and nonprofits together can partner to achieve solutions no single entity could accomplish alone. For the health and well-being of our children, it’s time we embrace the Food Pharmacy’s lead and join together across the Greater Philadelphia region — businesses and nonprofits alike. Peter Grollman is senior vice president of external affairs at Children’s Hospital of Philadelphia.